In the study, the researchers developed a technique to dry and stabilize the measles vaccine – which depends on a live attenuated virus – and showed that it remained effective for at least 30 days after being placed onto the microneedles. They also demonstrated that the dried vaccine was quickly released in the skin and able to prompt a potent immune response in an animal model. The microneedle technique could provide a new tool for international immunization programs against measles, which killed nearly 140,000 children in 2010. The research was reported online October 5 in the journal Vaccine, and will appear in a special issue of the journal. The research was supported by the Georgia Research Alliance – and indirectly by the Division of Viral Diseases and Animal Resources Branch of the CDC, and by the National Institutes of Health through its support of efforts to develop a microneedle-based influenza vaccine. “We showed in this study that measles vaccine delivered using a microneedle patch produced an immune response that is indistinguishable from the response produced when the vaccine is delivered subcutaneously,” said Chris Edens, the study’s first author and a graduate student in the Wallace H. Coulter Department of Biomedical Engineering at Georgia Tech and Emory University. 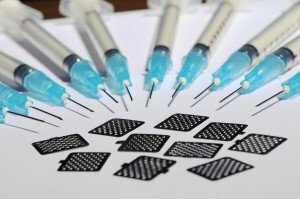 Measles immunization programs now use conventional hypodermic needles to deliver the vaccine. Large global immunization programs therefore require significant logistical support because the vaccine must be kept refrigerated, large numbers of needles and syringes must be shipped, and the ten-dose vaccine vials must be reconstituted with sterile water before use. Because it requires a hypodermic needle injection, measles immunization programs must be carried out by trained medical personnel. Finally, used needles and syringes must be properly disposed of to prevent potential disease transmission or reuse. Use of microneedle patches could eliminate the need to transport needles, syringes and sterile water, reducing logistical demands. Vaccination could be done by personnel with less medical training, who would simply apply the patches to the skin and remove them after several minutes, making possible door-to-door campaigns similar to those used in polio vaccination. Single-use patches could also reduce the waste of vaccine that occurs when all ten doses in a vial cannot be used. Many countries in the Western Hemisphere have eliminated endemic transmission of the disease, though travelers often serve as sources for imported cases. However, measles remains the leading cause of vaccine-preventable death among children elsewhere in the world, prompting interest in alternative vaccination techniques. In their study, the CDC-Georgia Tech team first faced the challenge of converting a liquid vaccine to a formulation that could be readily applied to stainless steel microneedles and dried for packaging. The work was made more difficult by the fact that the vaccine contains an attenuated live virus whose integrity had to be maintained. The researchers began by studying materials that could be combined with the vaccine to improve its stability in dry form. Ultimately, they obtained the best results by adding a sugar known as trehalose to the liquid vaccine. That formulation was applied to the microneedles – which were about 750 microns long – by dipping them into the solution and allowing the liquid to dry. The vaccine dose on the microneedles was controlled by the number of times the microneedles were dipped into the solution. Cotton rats (Sigmodon hispidus) used in the study were divided into seven groups of five animals each for the testing. The comparison showed that vaccination with the microneedle technique produced an immune response that was statistically indistinguishable from that produced by vaccination with the hypodermic needles. “The two major accomplishments of this study are that the vaccine can be stabilized on microneedles, and that it could dissolve in the skin to provide a good immune response,” Rota said. To advance the microneedle technique, the researchers are now working to improve the stability of the dry vaccine with the goal of eliminating the need for refrigeration. They are also studying the use of polymer-based microneedles that would fully dissolve in the skin, removing the need to dispose of potentially infectious waste. Ultimately, a microneedle-based measles vaccine will need to be evaluated for safety and efficacy in a non-human primate model and in several clinical trials before it can be used routinely in humans. Microneedles are also being studied for administration of vaccines against influenza, polio, rotavirus, tuberculosis, and hepatitis B. The microneedle measles vaccine would likely find its first use in the developing world as part of measles elimination campaigns, and would probably not replace the Measles-Mumps-Rubella (MMR) vaccine used in the United States. In addition to those already mentioned, the research team included Marcus L. Collins and Jessica Ayers, both from the CDC.